My name is Julie. I live in West Jordan, Utah. I have followed your blog for a little over 3 years.On a recent trip to visiting my grandparents graves, we came upon Lucy's. I couldn't believe that here she was.I had my kids in tow with me, and I just had to take a picture. I was actually googling the last name Jackson (my maiden name) to see if there were any blogs of distant relatives. I saw yours and the name Jacksonparkcity and thought to take a look, not knowing the sadness I would find. I remember reading the blog for the first time. I had goose bumps and tears streaming. How could something like this happen to someone so sweet? Lucy is beautiful and to read how alive and vibrant she was, to lifeless. I think about Lucy often. You see, I picture her in heaven with my little boy, Taylor James. It's been over 4 years since we lost our infant son. I was 2 days shy of 39 weeks and my schesuled C-section when we found out he had passed. (cord accident). My life and my world have forever changed. I will never be that same person. Friends say that I am such a strong woman and that only earth angels could deal with the pain of losing a child. Well, I sure as heck don't feel any stronger.. In fact, I feel the oppposite. I feel vulnerable. I fear every time my child has an illness. I worry about them constantly. It takes a toll on ones body.. I have so much anxiety that my hair even started falling out. Taylor was indeed perfect. Perfect features. He was truly beautiful. I have special memories of Taylor. I was 7 months pregnant when my husband and I flew to NY. Taylor experienced a Yankee game and danced in my belly when we attended the Eric Clapton concert. He was very active each night at 10pm. I had horrible heartburn with him. I had several dreams while I was pregnant with him that left me puzzled and scared. But I realize, they were preparing me. I feel that I am still in "recovery". But, Molly, your blog brings me joy, pain, happiness, sadness, EVERY emotion. Your blog is amazing and very REAL. I look forward each day to reading your words. You are truly one of my heroes! *Note from Molly: It is astounding to me that a "perfect stranger" would care enough to take a photo at my Lucy's resting place. I was deeply touched and emotional when I received this email and photo. Also, my brother's name is Taylor James as well, so I found this email from Julie touching on so many levels. Thank you to everyone who has sent in Reader Monday submissions. I've been a little out of order in posting them (and in remembering who I have posted and who I haven't...Oh, to be better organized). I look forward to sharing photos from NYC this week, thoughts on Vic's post, and some other neat things that happened to me. You are all wonderful. Thanks for supporting me and my blog, my family, my children. I love and support and admire and acknowledge all of you and your amazingness and struggles. Let us all press on. I have to speak up here. My sister-in-law just sent me a link to this post, and it's amazing to see the similarities: eleven years ago today (October 3rd), my son, also Taylor James, was stillborn. As we visited his grave this evening as a family, I experienced a brief feeling of loneliness, of wanting to reach hope, and feeling that I'm not alone. Of course, in my head I know I'm not alone, but on days like today it's not always easy to feel that way. What a blessing we can all be to each other as we share our experiences, even in the details of shared names. Lovely to meet you Julie... I am sorry for your loss as well. 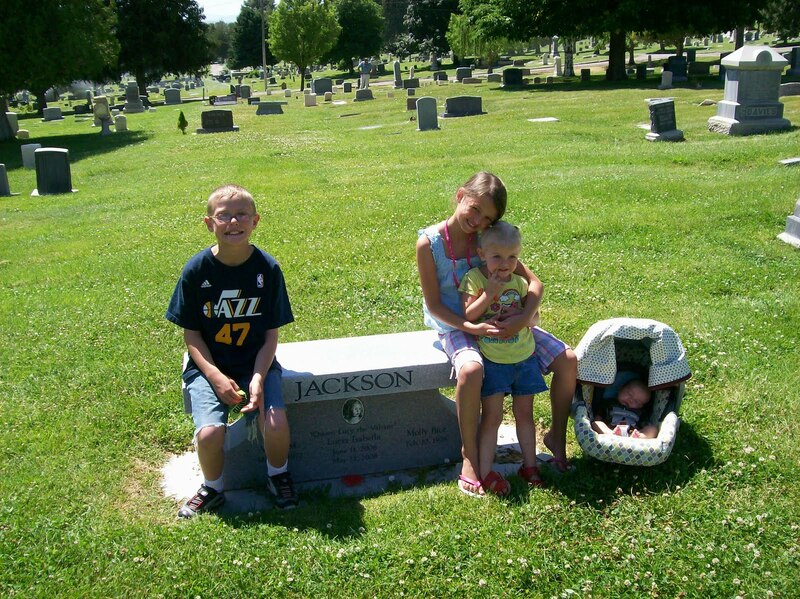 I love the photo of your kiddos visiting Lucy's resting place... funny we say that... as she in heaven romping it up and having a ball with Taylor James. I loved reading this because it's a good reminder that the Lord knows us and puts people in our lives for a reason, even if they are perfect strangers!